South London based Deprevate go against the status quo of the fact that Metal does not necessarily have to go hand in hand with screamed undecipherable vocals. Featuring heavy riffs and breakdowns galore, it is also accompanied with soaring vocals that fly over the tracks and really hit home. Melodic Metal is a genre that really divides public opinion and it is a genre that normally needs quite a lot of power to break through the hordes of wannabe acts that are out there at the moment. Deprevate is one of these acts that are gaining the momentum to break through, helped by none other than Matt Hyde who has worked with metal titans such as Trivium and Machine Head. This in itself is a glowing praise of recommendation, and the production really stands for it, everything on the mix is really clear cut and mixed perfectly. 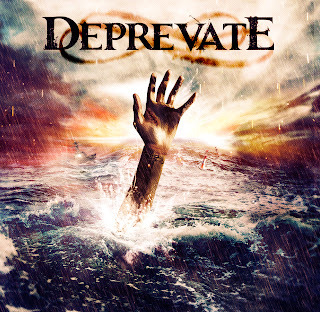 This is a genre that does grow stale very quickly however and Deprevate will need to evolve in order to stay fresh but at the moment they are creating a lot of ground movement and are definitely a band to keep an eye out for in the future.